Wednesday Test Run from UNSW Solar Racing Team on Vimeo. 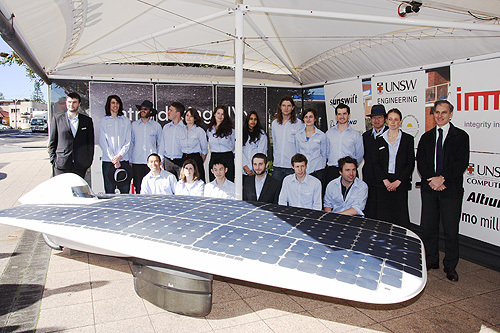 The University of New South Wales (UNSW) Sunswift Solar Racing Team will attempt to break the world land speed record for a solar car next month. The team's solar car, affectionately known IVy, is a $280,000 three-wheeled, hand-built, carbon-fibre machine which can reach a top speed of 115 km/h using just 1300 W, the same amount of power it takes to toast two slices of bread. With nothing more than solar energy from photovoltaic cells (no additional power from a battery), the team expects the car to hit at least 90km/h, which would break the record by 11km/h. At a recent test run at the Western Sydney International Dragway at Eastern Creek earlier this month Business team leader and driver Kristen Casalenuovo said the attempt would show just how quickly solar innovations are progressing. "A lot of the things created within solar have been adopted with electric cars seen on the road," the photovoltaics PhD student said. A Guinness World Book of Records official will attend the attempt at an airstrip at the HMAS Albatross near Nowra on the southern NSW coast. The team’s world record attempt looks promising after they recorded a top speed of 115km/h during the 3000km Global Green Challenge from Darwin to Adelaide. The Sunswift team need perfect conditions with no wind or clouds so the panels can generate maximum possible energy from the sun with minimal aerodynamic resistance.